Goodreads Synopsis: Ask Aria Morse anything, and she must answer with the truth. Yet she rarely understands the cryptic words she‘s compelled to utter. Blessed—or cursed—with the power of an Oracle who cannot decipher her own predictions, she does her best to avoid anyone and everyone. 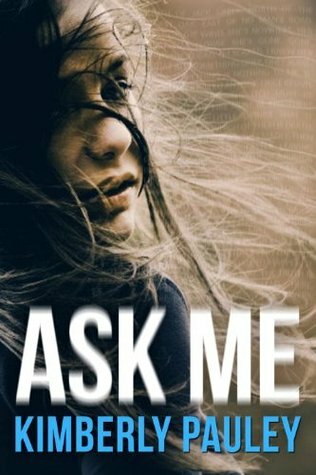 Ask Me by Kimberly Pauley was a great book. I enjoyed it from beginning to end and I was so surprised on how good it turned out! Definitely looking out for more of Pauley’s books! In Ask Me we meet Aria Morse, with the gift to answer everything someone asks her. The gift has been passed from her gram to her mom and now to Aria. I actually thought of how cool this would be if I had it, then again you might accidentally spill out things you don’t want to say so I take it back J I liked Aria a lot, she had a cool and relaxed personality, but in moments where the plot heated she still had her cool. The whole concept of Ask Me worked well! I love the idea and it was fairly executed properly, but it did need work on explaining Aria’s gift more and possibly more of her family’s history too? Overall, job well done. What caught my eye in the book was how each chapter had its song own! I found it fun and inventive and I actually never seen this done! Plus, it gets you connected to the story and characters more. Definitely recommend you listening to some of the songs for each chapter! Action was lacking for me in Ask Me, even with its fairly great ending. Everything came together smoothly and it actually FLOWED! Most novels that have strong ideas lack in bring the whole. story together in the end, but Ask Me did it great. The characters came together, Aria realizing what her gift truly was, was all exciting to read! I recommend this book if you are a fan of dark paranormals in YA. Be on the lookout for this one! I've been seeing a lot of this book lately and it sounds pretty good. I'm a big action kind of person, so I'm kinda of on the fence. I'm glad you enjoyed it Patrick! I wasn't sure about this one, but you've convinced me that maybe I should give it a try!